People have been turning up at Hull Royal Infirmary’s A&E department to ask emergency staff to remove acrylic nails and squeeze their blackheads. Hull University Teaching Hospitals NHS Trust is producing a video revealing the non-medical requests from the public as emergency frontline teams come under the toughest winter pressures in recent years. In the video, nursing staff tell how people have arrived at the emergency care area at Hull Royal Infirmary to ask them to remove false nails and even squeeze blackheads. Others have turned up in the department with stomach upsets despite the widespread availability of over-the-counter remedies and the risk of spreading the bug throughout the hospital. Kevin Philips, chief medical officer at the trust, said: “The staff working in our emergency department must be free to deal with people facing life-threatening emergencies. “However, some of the ‘problems’ staff are asked to deal with are not emergencies or even problems requiring medical attention. “We are trying our best to cope with the demands of winter as we see increasing numbers of patients with complex health conditions who need to be admitted to hospital. The video has been produced as part of the trust’s “A&E: It’s Serious Stuff” advertising campaign to urge the public to use alternative health services such as their GP, pharmacies, minor injuries units and the urgent care centre at Bransholme. 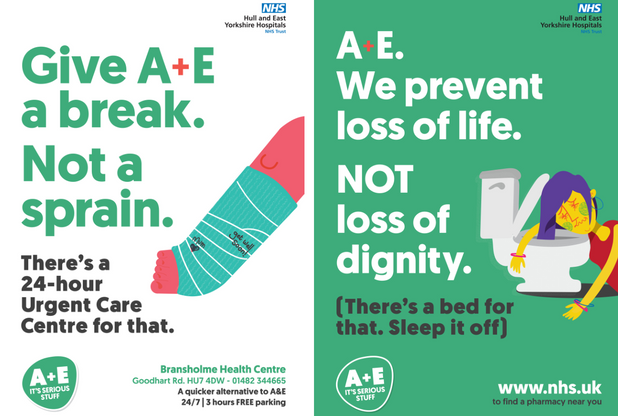 Bus advertising, billboards and posters have been produced with slogans including “Give A&E a break. Not a sprain” and “A&E. That’s emergency care. Not emergency contraceptives”. Posters are also appearing in pub toilets with the message “Being drunk isn’t an accident. It’s not an emergency either” in an attempt to persuade drinkers not to visit A&E with hangovers or the effects of excessive alcohol consumption.